I ordered the tiny cellophane bags on Amazon because a pack of 50 were way cheaper than a pack of 10 at the local craft store and used some leftover cardstock I had on hand for the toppers. Which, you know, I had fully intended to type up and make pretty but then it got late and I decided to just borrow a couple of Ethan's markers instead. 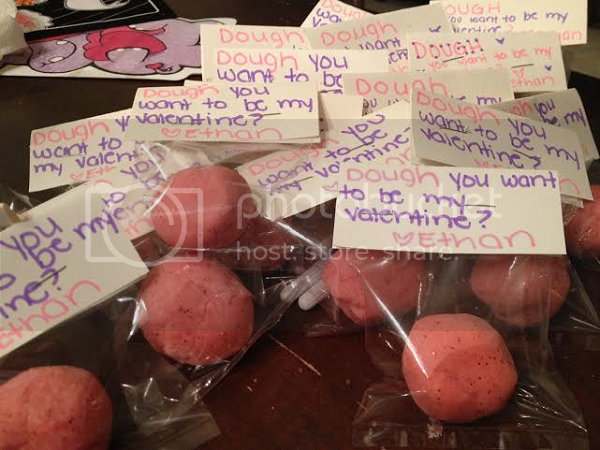 I used my favorite go-to play dough recipe (this one from Mommy Footprint) but kneaded in some red food coloring, red glitter and vanilla extract in the end to make it sweet and pretty and perfect for Valentine's Day. In the morning, I showed Ethan all of my hard work while he was busy sleeping in his bed the night before. In return, he gave me a lecture on why the play dough is staying at our house and he is not, under any circumstance, giving it to anyone else. Not even his friends who I had named. Good start. 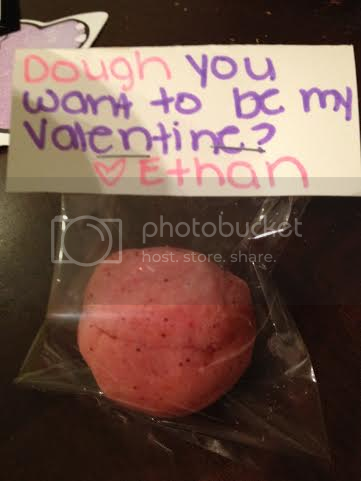 Somehow once we got to My Gym and his classmates started arriving, he realized how much fun Valentine's Day could be if he shared the play dough and so he did. I mean, instead of the "happy Valentine's Day" we rehearsed all morning, he handed each bag to a kid and said "here you go. I squished your play dough." Whatever works, right? So here are the iPhone photos I took to text to my mom.